Hot on the heels on Vanguard’s first ETF launched in Hong Kong in May 2013, three additional ETFs were launched in June 2014. For those of us who are watching with anticipation for Vanguard to reach Singapore shores, this should be good news. Till then, you would now be able to purchase Vanguard’s four ETFs that are listed on Hong Kong Stock Exchange. If I’m not wrong, the withholding tax rates for dividends in 0% for Hong Kong, which is a major, major advantage. For United States, in comparison, the withholding tax rates for dividends is 30%. 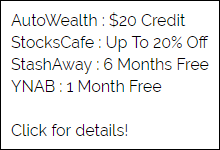 From US >> HK 30% is already applied, so there is no tax savings. Fancy “owning the world” in a single click of your mouse? What we really need is a World Index ETF much like Vanguard Total World Stock ETF (VT). We don’t pay anyone in the middle and that’s one of the reasons we keep costs low. The current situation in Singapore is rather unfortunate for Vanguard. The firm in Singapore holds a type of capital markets services licence that does not allow it to market itself to retail investors. Three Vanguard funds are available through Lion Global Investors, labelled as the Infinity range, which comprise stock index funds tracking the SP 500 index, MSCI Europe and MSCI World Free indexes. The Infinity funds charge a sales charge of 2 per cent and annual management fee of 0.475 per cent. In contrast, the equivalent Vanguard index funds in the US have an expense ratio of 0.17 per cent. PreviousGet $10 Off Groceries From RedMart and more! 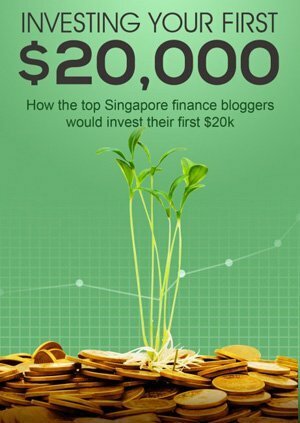 Should I Care If The Straits Times Index Goes Under 3,000? I was following your posts and learning from you recently. Just thought I would share some of my findings too. When it comes to passive investing, here is another ETF which you may want to pay attention to. Expense ratio of 0.05%. Probably a new record low. Thanks for sharing! 0.05% is ridiculously low and there is probably no better deal around. Pity it tracks S&P 500 and not a global index. hello, i can’t wait for vanguard to start offering etfs to retail investors in SG. In the meantime, would you consider buying vanguard HK etf through SCB’s online trading platform? Your posts have been very useful! please keep them coming! Thanks gp! The more I share, the more we learn together. I would definitely consider buying Vanguard ETFs via HK. However, a world index ETF is currently not available, which is the only one I’m interested in. Who knows, it will probably be in the next round of ETFs to be launched. Just a quick introduction of myself. I started investing back in 2012 and i only invest into sti etf. ( I had a number of others stocks so I am actually active back then). Until recently I found that it’s too much work and I ended up having some difficulty monitoring my portfolio. 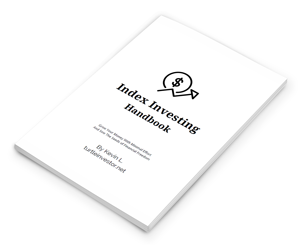 I knew passive investing into index fund was the solution so I did a little research where I found you back in 2013 and I have been following your blog roll ever since. I have a question here which has been on my mind ever since I started indexing. Our sti market cap is relative small as compared to The US . In order to avoid a black swan event, I figures that my portfolio will have to diversify internaltional. However what is hindering me to do that is the currency risk. Looking at the chart on Usd/sgd over the past 20 years is downright terrible. If I were to invest a fraction of my portfolio into the s&p, I would have lost 1-2% return annualized as compared only invested in STI. While diversify reduce the non systematic risk, I believe it comes with a cost. Question is, is it worth the extra cost? What is your view on this? Will be happy to discuss further. At the moment, I am trying to form a lazy portfolio with exposure into the vanguard world index, sti and something that tracks the Asia pacific ex japan brenchmark. I am thinking that it should hold a basket of diversified assets in different currencies thereby reduces currency risk.At this point, I do not have enough data to prove if this will work due to lack of long term track record. Very happy to receive your comment on my blog. We would have started investing around the same time then 🙂 I agree with you that STI is only a drop of water in the ocean. Using Vanguard Total World Stock ETF as a guide, we can see that US accounts for roughly 50%, whereas Singapore is a paltry 0.6%. Personally, I feel that eventual diversification is a must. The best case scenario is for a world index ETF to list on SGX using SGD as the trading currency, which is currently not available. I feel your pain, since both of us face the same limitation and same dilemma. Thus, risk of not diversifying VS currency risk – which is the lesser evil? I’m inclined to diversify despite currency risk (well, it could work against me, or it could work in my favour), though I’m not exactly sure if this is the correct choice, nor do I know whether I will still think the same way in future. I feel that your idea of a basket of diversified assets in different currencies is a good one, but it will violate my personal preference of keeping my investments simple with as few components as possible. What components are you looking at to form your portfolio? 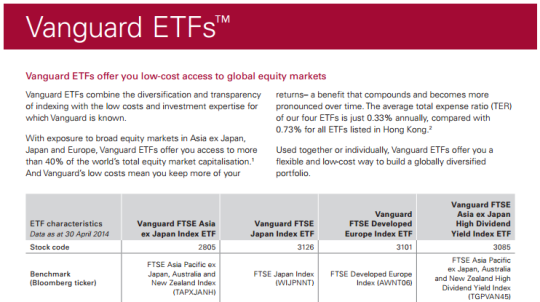 Looks like this Vanguard ETF in Hong Kong is exactly what you need to track Asia-ex Japan. Glad to see your reply. Yes, it appears we have started around the same time. =) Currency risk probably is a not so significant problem to consider over long run. I have added vanguard world index, Vanguard developed asia pacific ex japan (both listed in UK) in favour of a lower expense ratio comparing to Ishares. i have also slice n dice by adding a small faction of my portfolio by adding Ishare developed asia property to mimic a REIT index(mainly due to a lower co-relation with equities, or so i’ve heard.) and Vanguard Emerging market to add a stronger dose of China, Brazil, India and Russia exposure. They are all listed in UK with dual currency which you can buy in USD and collect dividend in USD. I read in the comment of a fellow blogger’s blog that its a better this way to reinvest the dividends which are in USD so to avoid the high spread standard charter (SCB) is charging for currency conversation. The spread for USD is lower compare to GBP and HKD as well. With this my single foreign country exposure is just a 10% at its highest, excluding Singapore. Vanguard had recently launched more ETF in UK. The VEVE seems more attractive to me due to a lower expense ratio as compare to VWRL/VWRD. However since its new, the performance and portfolio data are quite limited. I might do a switch in two year’s time. including STI, these forms up 60% of my portfolio. The rest are in SG bond/cash. Along the way, i will twist a little if i find an asset class with lower co-relation compare to equities. I will also increase my equity position to 80% once a market crash comes. It sounds easy. The hardest part is to stay with the plan. As far as I understand, the currency that the ETF trades in has little bearing on the risk. It is the currency of the underlying asset that does bear some risk (but also can work in your favour as well if it swings your way). For example, if I bought VTI (Vanguard Total Stock Market ETF) for SGD $1000, right now it would be worth USD $800. The underlying assets are all USD so it’s easy to understand that when I sell it off, it will be just a straight forward conversion back to SGD if I wish and that I’d be taking on the currency risk factor. The point is that when I bought into it with either SGD or USD, it wouldn’t make any difference at all to the end result. It’s just a conversion at that initial point in time. Ultimately buying a Total World ETF like VT, you will get some assets that go up and down in value, and likewise you will get some currencies that go up and down in value. Ultimately we hope that when all is said and done the end result is going to be positive when we finally want to sell out of it. Once again, the currency that the ETF is trading in is not important. It’s only the assets themselves that matters. Based on your reply, it would seem that there is an erm, critical flaw, in my understanding. All along, I have thought otherwise. Guess I’ll probably be taking some time to re-think this through. Standard Chartered’s commissions are attractive but forex conversion is really expensive at 200 pips (equivalent to 1-2%) over the spot rate. Thanks wh for sharing, that’s really expensive. I can confirm that the withholding tax is 0% for Hong Kong shares which is very good news indeed. Quite excited about the offering and have invested quite a bit into both 3085 and 2805. Quarterly dividends are nice and I am rather curious how high the dividend yield will be when 3085 will pay its first dividend next month. I’m looking forward to the information as well. Looks like Vanguard’s target is 10 to 12 ETFs by the end of 2015 according to Vanguard’s Asia regional MD, Shelly Painter’s response. With their focus on Hong Kong (good chance of a world-index ETF), it practically means little chance of a local office in the mean time. I’m about to dip my toes into index tracking ETF’s as well in SG and have been facing the same problem as yourself — you’d like to purchase a World ETF like VT but don’t want to buy in the US due to the withholding tax, and also the nasty estate tax! (touch wood). I’ve been looking at J0P.SI – what are your thoughts on it? Fees are not too bad @ 0.45%, but it is a synthetic ETF which may turn off some people. Otherwise I’m about to go for it. To be honest, I don’t know much about J0P.SI. I know of it as one of the two non-physical world index ETFs listed on SGX, the other being Lyxor UCITS ETF MSCI World. I guess the large fund size helps to hold down the expense ratio, plus being UCITS III compliant probably reduces the risk involved. For the lack of a better option, I *might* consider going for it. Maybe a little bit more research first. I’ve looked at Lyxor UCITS ETF MSCI World (H1P) as well (TER also 0.45%), but the volume looks very low on it. Even J0P’s volume is not very high either. Correct me if I’m wrong but that could present a problem if I ever want to buy or sell in larger lump sums. I need some help understanding this particular area, for example, let’s say that I put in a Limit Order Buy for 100,000 shares at $1 that expires same day – but on that day only 50,000 shares are available at that price. If I understand correctly my brokerage will purchase those 50,000 worth of shares (partially filled) and will charge me accordingly on their regular fees schedule. If however, I change the expiry to be 2 days, maybe on the second day those second lot of 50,000 shares may become available and will be purchased for me. In that situation that would complete the order and I would be charged the fees for that single larger order (100,000 shares @ $1). Why I’m asking is that in the first scenario it may be that I pay 0.25% on the partially filled order as it would not meet the dollar threshold for lower fees. Whereas in the second scenario, because the total order is bigger I may get to enjoy the lower 0.20% on fees. Is that your understanding of how it works as well? Or am I way off!? My apologies, I missed this comment earlier. I’m afraid I can’t answer your question since I don’t have the expertise in this area. Perhaps you can give your friendly brokerage a call and quote them this scenario? They would be glad to help! does this mean that if I were to buy the hongkong fund through say dbs vickers , I will be buying through Lion Global Investors and attract the 2.475% fees? When you buy any equity that is not listed on sgx, you will your shares held under a custodian account. The vanguard etf therefore falls under this category since it’s listed on Hong Kong exchange. By doing so, you avoid buying through a fund house which charges you additional on-going expenses and probably some sales charge. To sum up, no you won’t incur 2.475% charge from lion global if you were to buy the etf directly from HK exchange, but you would have to incur the fees said on dbs and i believe these fees would have to be part of lion global’s expense ratio. We as passive investor should therefore have to compare our total expense ratio if we were to buy directly from foreign stock exchange, against the total expense ratio(including management fee) of what the intermediary funds have to offer us. No worries, and thanks for sharing your reply! If you have noticed, I typically share either from my own experiences, or information I have come across. In many cases, readers are much more knowledgeable than myself. Thus, my stand is, you guys can feel free to reply and share to your heart’s content! Nice and informative blog you have here. I stumbled upon your blog when surfing around. Just want to confirm my understanding about the 30% US dividend tax. It doesn’t affect capital gains does it? I am currently invested in VTI and VEA, but have not sold any of my holdings. In a typical scenario, we are not subjected to capital gains tax. I have successfully sold US stocks without having to pay capital gains tax. first time looking through your blog.. excellent stuff! does this mean you are vested in that? which platform are you buying it from? reason i am asking, is that i am trying to slowly diversify my portfolio, as they are more SGP-centric now. the Vanguard VWRD ETF divd payout seems quite decent. Thanks for dropping by! Yes, I’m vested and it is USD-denominated. There is a VWRL variant that is GBP denominated. I’m buying via StanChart. (1) are you practicing the passive investment with a fix portfolio that need to balance like once or twice a year? (2) Mind to share what are the ETF that you currently holding? (3) I am keen in the SPY but I am concern about the estate tax. Would you able to advise what are the alternative? Will the 3140.HK (Vanguard S&P 500 etf listed in HK) solve this problem? I heard some forum mention that open a joint trading account with US online brokerage may able to resolve this bit I am not sure how true it is. (4) Any advise on the brokerage firm that you are using other than SC. (1) I’m largely adhering to a targeted asset allocation but I’ll hardly call it passive, due to the fact that I try to do purchases on a monthly basis to rebalance it back to my targeted allocation. But if you meant whether I time the market or “trade”, the answer is no. (3) I have written on what I know about it, and the idea is if you want S&P 500 without the estate taxes, go for the ETF where the location of domicile has no estate tax concerns. 3140.HK will solve the problem (I think) but dividends-wise, it will be a poorer option than VWRD (listed on London Stock Exchange). (4) I’m using DBS Vickers as an alternative backup, but primarily using SC.